The Redmi Note 6 Pro is yet another Great SmartPhone from Xiaomi, after the Redmi Note 5 Pro. The Redmi Note 6 Pro is also a great device but Miui make it Bad for some of the Users and they wanna try the New Custom Rom also Some need Google Camera, but You need Camera2Api to Use that in your Redmi Note 6 Pro. Many Users want to Install TWRP on Redmi Note 6 Pro and Root Redmi Note 6 Pro. We have already made the guide on How to Unlock Bootloader for Redmi Note 6 Pro. 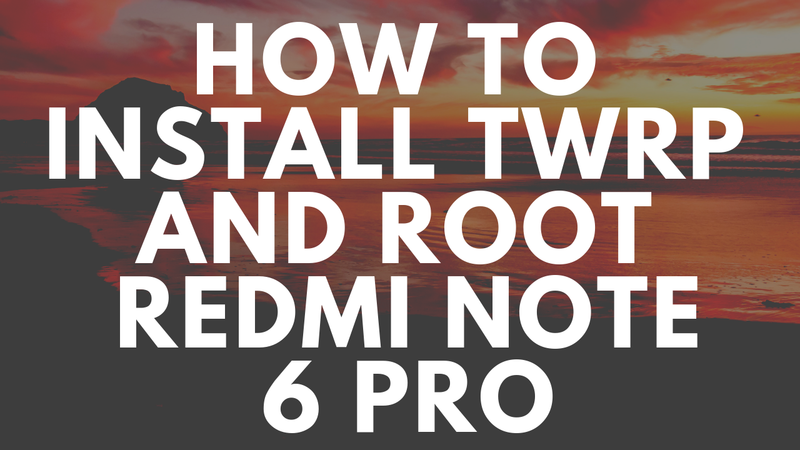 So here in this tutorial, we will show you have to Install TWRP on Redmi Note 6 Pro and How to Root Redmi Note 6 Pro with Magisk Manager. Once TWRP recovery is Installed in your Phone, you can easily Install Custom Rom, enable Camera2api and Root Redmi Note 6 Pro.TWRP has many benefits, if you are interested and Want to know How to Install TWRP recovery and Enable Camera2Api and Root Redmi Note 6 Pro then READ article Step by Step. Warning: harshittechnical.com is not responsible for any damage that might happen to your phone during this process. You’ll lose all your data upon unlocking the bootloader. Rooting and Install TWRP process is not so easy it requires patience and it some time. So, read all the Steps very carefully and DO NOT skip any Steps. One wrong Step can make your device stuck in a bootloop and will Brick your Phone. Redmi Note 6 Pro with Bootloader Unlocked, OfCource! Install ABD and Fastboot on your PC(When asked to install driver choose YES). Download TWRP image file here. Download the Disable_Dm-Verity_ForceEncrypt.zip and save the file on Desktop. Enable the USB Debugging On your Redmi Note 6 Pro, Go to Settings > About Phone and tap on the MIUI version 7 times. Developer options can now be found in Settings > Additional settings. Developer Option and Enable OEM Unlock and USB Debugging. Connect your Phone to the Computer using the Cable you got within the Box. Open Command Prompt on Windows using Windows key + R and type "cmd" press enter. Now you need to Check if your devices are Connected or Not, we will check it with the Help of the Some Commands. You will see your Device if it is Connected else you will get permission in your Phone to access USB debugging, give it OK.
Now after the devices is Connect we need to Reboot the Device into the Fastboot Mode. We can do it using ADB Command or Simply by Turning OFF the Devices and Turn on Pression Volume Down Key and Power Button key. Once we Boot into Fastboot recovery Now we need to Flash the TWRP into the Redmi Note 6 Pro. For that, we need to Type some Command also make sure you have downloaded the TWRP image file in your Computer. TWRP recovery is now Successfully Installed on your Phone. Now time to boot in TWRP mode. Type the following command. Now your Phone will be Booted into TWRP Recovery and you will see it ask for the Password and Option to Select language. Click on Select language and select English. Tap on the cancel button, go to wipe > advanced wipe and Wipe Data only. Reboot to recovery and connect your phone the PC and save the DisableForceEncryption, zip on your phone. Now tap on the install Button and install the Disable_Dm-Verity_ForceEncrypt.zip file. Now you are done. Reboot System. HOW to ROOT Redmi Note 6 Pro. Boot your phone TWRP mode and save the magisk zip file on your phone. Now to go where you have Save magisk zip file choose it. Once the Zip file is successfully installed on your phone. Reboot System. Now Your Redmi Note 6 Pro is rooted and TWRP is installed. It works!! Thank you! all your data will be lost, keep that on mind!